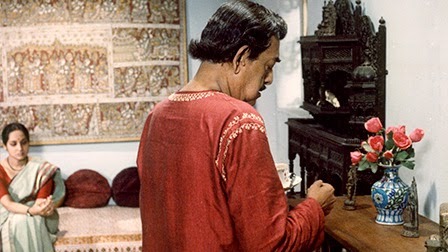 Writer-director (and composer and camera operator and just about everything else) Satyajit Ray's characters must be the most subtly shaded and sensitively observed in all of cinema. He could breathe life into even the most minor players in just a few shots; over the length of a feature film his protagonists emerge as rich and nuanced as characters carefully sculpted over many years of episodic television. Cliches and stereotypes had no place in the world of a humanist who cared far too much to take shortcuts or settle for easy answers. Ray only honed his strength over the years, a fact evidenced by the complex personalities inhabiting the three films in this “Late Ray” set from Criterion. After his debut film “Pather Panchali” (1955) made him an international star and the de facto representative of all Indian cinema to much of the rest of the world, Ray vaulted over the high bar he had already set with a steady string of masterpieces from the rest of the Apu trilogy to “The Music Room” (1958), “The Big City” (1963), “The Chess Players” (1977) and still more. By the end of the '70s he was widely hailed as a national treasure, yet somehow avoided letting either the fame or the responsibility interfere with his work. After a brief break at the beginning of the '80s, he was finally ready to adapt the Rabindranath Tagore novel he had originally planned as his first film. Ray had secured the rights to “The Home and the World” back in 1948, and patience proved to be a virtue when he finally began shooting in 1982. 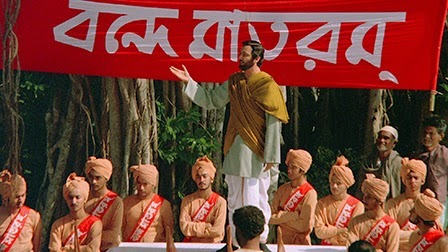 Set in 1907, the film (released in 1984) takes place shortly after the British Lord Curzon partitioned Bengal, heightening tensions between Hindus and Muslims and leading to the rise of the nationalist Swadeshi movement, a call to boycott foreign products in favor of homegrown. As is typical in Ray's work, the film addresses sweeping historical changes by focusing on a few characters caught in the middle. 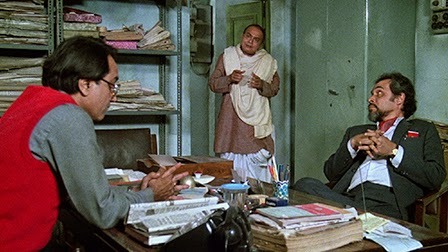 Soft-hearted liberal aristocrat Nikhil (Victor Banerjee) encourages his bright but cloistered wife Bimala (Swatilekha Chatterjee) to meet his old school friend Sandip (longtime Ray collaborator Soumitra Chatterjee) who has arrived for a visit. It's a business trip, as Sandip styles himself the political firebrand who can fan the Swadeshi flames on Nikhil's land. Yet in that grand Ray fashion, Bimala does not exist merely to choose between two men, but also to chart a course for herself; one of the most delicate balancing acts in the story is her effort to become her own person despite the annoyingly enlightened insistence of her husband that she do so. Sandip's fanaticism flashes an early warning sign, and there's little doubt his partisan brand of Swadeshi will topple into violence, but Ray never lets him become a mere villain. Everyone shares their reasoning both with each other and with the audience, making for a truly dynamic, organic story. Ray suffered a heart attack during filming on “The Home and the World” and could not return to directing for several years. Still severely limited, he established a less physically taxing regimen which might explain the restricted, functional look of “An Enemy of the People” (1989), shot almost exclusively in studio. Working from the 1882 Henrik Ibsen play of the same name, Ray transplants the action from 19th century Norway to the 1980s in a small town in Bengal. A doctor (Soumitra Chaterjee again) discovers that the holy water at the local Hindu temple is polluted and is shocked by the political resistance he meets in his effort to reveal the health threat to the townsfolk; that temple's a goldmine for lots of people. The outlook is more clearcut here than in the previous film, as the doctor winds up having to stand almost alone against the forces of corruption, but Ray unpeels the various layers of that corruption from the bigger fish with the most to gain to the smaller players who sometimes wind up cozying up or caving in to power. “Enemy” is clearly the least accomplished of the three films in the set, but still absorbing and surprisingly lean at 99 minutes. Which brings us to “The Stranger” (1991) and perhaps Ray's most memorable character since Apu. The routinized life of a bourgeois Indian couple is disrupted by the receipt of a letter. The gobsmacked Anila (Mamata Shankar) reads shocking news aloud to her husband Sudhindra (Dipankar Dey): her uncle who disappeared when she was just a child three decades ago will be arriving by train in a few days and hopes to spend the week with them. The husband is instantly skeptical, but Anila remains guardedly hopeful. Their various suspicions will not be quickly resolved. The uncle (renowned theater and film star Utpal Dutt) had become a family legend in his absence, and it takes Anila time to understand him as a flesh-and-blood figure. An absurdly erudite world-traveler, he only becomes more enigmatic with each revelation about his time abroad; he has almost literally done everything and been everywhere (except Australia, his next stated destination). The couple and their friends, many still on the lookout for a scam, grill the uncle over a series of deeply engaged intellectual discussions, but it's clear that they've never met anybody quite like him. In his own words, he refused to be a “frog in a well,” unwilling to be trapped by the mere circumstance of his birth. One day he simply gave in to his wanderlust and never looked back. Dutt is absolutely riveting as the man who has an opinion on everything, and Ray observes him with a healthy balance of affection and skepticism. His obvious brilliance sometimes shines too brightly, and his need to extoll the glories of his globetrotting ways leads him to condescend unfairly to perceived Bengali provincialism. The film gleefully addresses the big questions (“Do you believe in religion?”, “What about science?”) while always scanning for the smallest details, and even drops the English word “floccinaucinihilipilification” just when you least expect it. Which is any time. “The Stranger” turned out to be Ray's final film. A year after its release he received an honorary Oscar which, alas, is far too often the sign that the end is near. Ray died shortly thereafter on April 23, 1992 at the age of 70 and right at the peak of his craft. Few directors maintained such a level of excellence from start to finish. It was always unfair to think of Ray as the sole representative of a vast and diverse national cinema, but that doesn't mean he was ever overrated. Many of us are just beginning to understand how truly great he was. Releases like this Eclipse set help with the discovery process. Unfortunately even the Ray films that have been offered on North American region DVDs have generally been of poor quality. Criterion helped remedy that with recent Blu-ray releases of “The Music Room,” “The Big City,” and “Charulata.” None of the three SD releases in this Eclipse set have been restored or can match the quality of the full Criterion releases, but what we get is better than most other Ray titles. “The Home and the World” looks a bit like a second generation copy with some distortion visible at times and somewhat mediocre image resolutions. Colors are fairly rich, however, and the overall transfer is solid. The other two transfers are stronger, though neither film is one of Ray's most visually arresting works. The color palette looks a bit oversaturated on “The Stranger” but no major complaints. All three films are presented in their original 1.33:1 aspect ratios. The Dolby Digital Mono tracks are about average overall. Perhaps the music (composed by Ray) would be better treated by a lossless mix, but the audio here is clean and consistent. One minor complaint: optional English subtitles are provided for the Bengali dialogue, but not for the relatively frequent English dialogue. There's no reason not to have subs for everything. Each of the three films is stored on a single disc and housed in its own slim keepcase, all three cases tucking into the thin cardboard sleeve for the set. As is usual for Criterion's no-frills Eclipse collection, no extras are provided on the discs. However, we get liner notes up to the usual excellent standards of writer Michael Koresky. 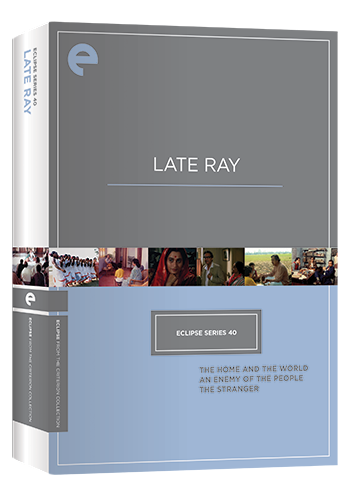 I'm not sure how much longer Criterion's SD-only Eclipse collection will continue to be viable, but I hope it's for quite a while because it's a great way for viewers to get films that aren't slated for restorations or high-def upgrades. I read one review describing these films as “minor” Ray releases, but that's just not right. “The Home and the World” and “The Stranger” are both quite major and it's great to have them finally available on home video in North America even without bells and whistles.